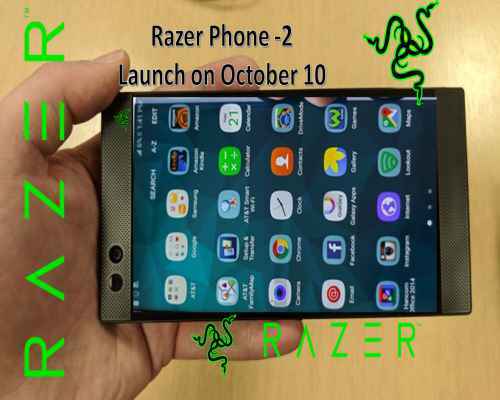 After Razer Phone, the company is now about to launch Razer Phone 2. On October 10 next, razor phone 2 will emerge. What will be the official name of the upgrade version of the razor phone launched last year, it is not clear right now. Only "Flagship // Gaming" appears in the invoice sent by the company. According to the website Engadget's report, the company has started sending the media invoice. On October 9, Google will launch the Google Pixel 3 Series during an event organized in New York, just one day before the launch of the new smartphone of the Razor brand. Razer Phone 2 has not taken the curtain right now. Razer Phone, launched last year, has a starting price of US $ 699 (about Rs 50,800) in the US. It is expected that the company could launch Razor Phone 2 at the same price. However, the cost and availability of Razer Phone 2 will be available only during the launch event. Recently, the Razer brand confirmed that the company will soon launch its next flagship smartphone. The company also expressed the desire that it would bring its computer service to the mobile platform. It is being speculated that the next flagship smartphone of the company could find razor game stores and zGold wallet. Apart from this, the new flagship smartphone can come with Snapdragon 845 chipset and 120Hz display. Let's take a look at the specification of the Razer Phone launched last year. Razor phone is the first phone in its segment, which supports Qualcomm's new Quick Charge 4 plus technology. Regarding the other specification of this model, the Razor phone has 8 GB RAM with Qualcomm Snapdragon 835 processor. The most important feature of the Device Razer Phone 2 is the 5.72-inch IGZO LCD ultra motion display. The screen's resolution is 1440x2560 pixels. Razer Phone 2 protection of Corning Gorilla Glass 3. The razor phone has two rear cameras with 12 megapixels on the rear side. One of these sensors is F / 1.75 aperture and second is F / 2.6 aperture. There is also a dual-tone LED flash module on the back side. The front panel has an 8 megapixel fixed focus camera with F / 2.0 aperture. Inbuilt Storage is 64 Giga Bites ( GB ) and it is possible to use MicroSD card up to 2 ( TB ) if required. Razor phone's connectivity features include Wi-Fi 802.11 AC, Bluetooth version 4.2, NFC, 4G. It comes with 4000 mAh battery. Demonstration of the handset is 158.5x77.7x8 millimeters and weighing 197 grams.